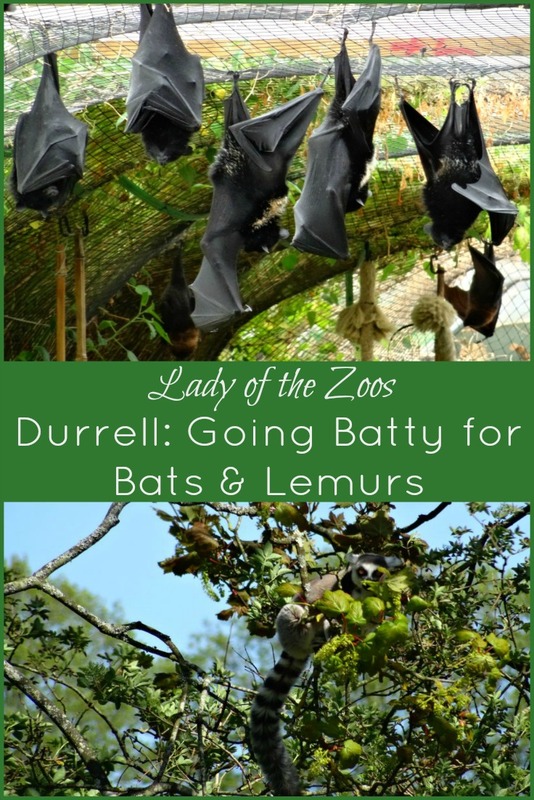 In the final chapter of my visit to the Durrell Wildlife Park I continue on the last leg of the park through the Island Bat Roost to Lemur Lake and finally to the Gerald Durrell Story exhibition. Much like the gorilla enclosure, the Island Bat Roost was built with the help of over 400 people who volunteered their time to help the staff at Durrell to construct not only an enclosure for bats but also a building with a message of sustainability. The bat tunnel is a large poly tunnel built from recycled tires which act as a heater with the tires soaking up heat from the sun creating passive solar heating. The rest of the heat is produced from biomass fuel from the Park’s animal and food waste. Most of the building is made from recycled or reused and repurposed materials which pays homage to Durrell’s message of conservation. 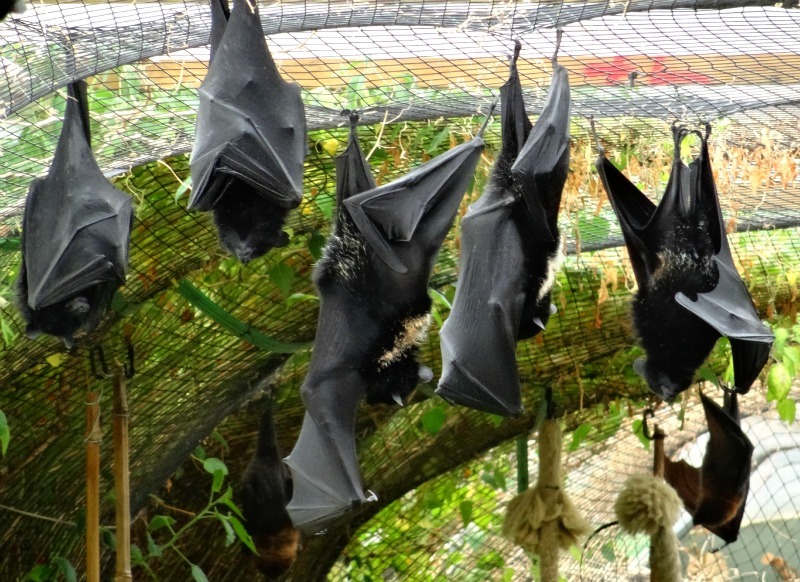 The Bat Island Roost is home to two bat species, the Rodrigues fruit bat and the Livingstone fruit bat. The Rodrigues was critically endangered in the 1970’s with less than 100 individuals but after continuous conservation efforts from various organizations and zoos their numbers have successfully grown to about 10,000. As for the Livingston fruit bat they remain critically endangered and are the most endangered animal at the Durrell Wildlife Park. The Livingstone fruit bat is the second largest bat species and one look at their fox-like face with their beautiful round eyes will melt your heart and hopefully curb your fear of bats. These amazing bats are the gardeners of the forest and if it weren’t for them we wouldn’t have rain forests as over 150 plant species rely on bats to help disperse their seeds and help them grow. Durrell has been highly successful in breeding these bats which was apparent with the few babies peeking out from under mom’s wings. Funny thing is, the ones I saw were last year’s pups and nearly the same size as mom. The best time to visit the Island Bat Roost is in the late afternoon when they’re more active. Next up on the tour is Lemur Lake. A beautiful expanse of forest and lake where lemurs leap from the tree tops above, Lemur Lake is a fantastic exhibit. 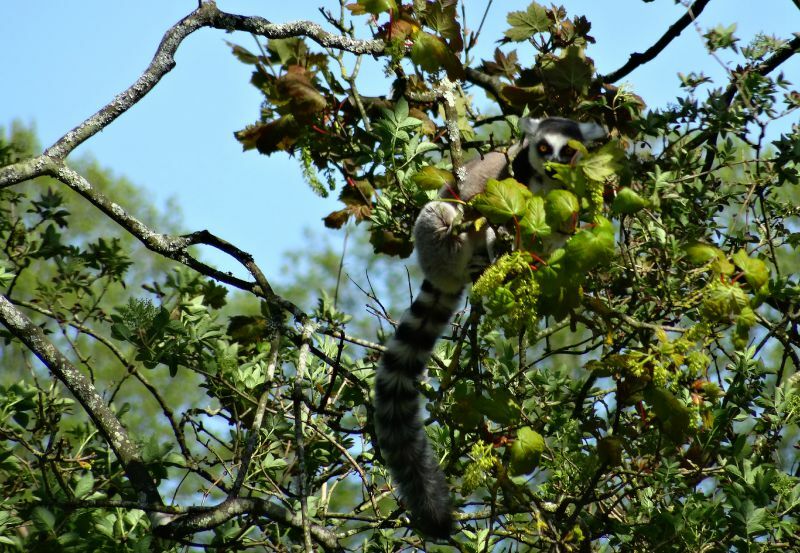 Home to ring-tailed lemurs, black and white ruffed lemurs and red-ruffed lemurs. 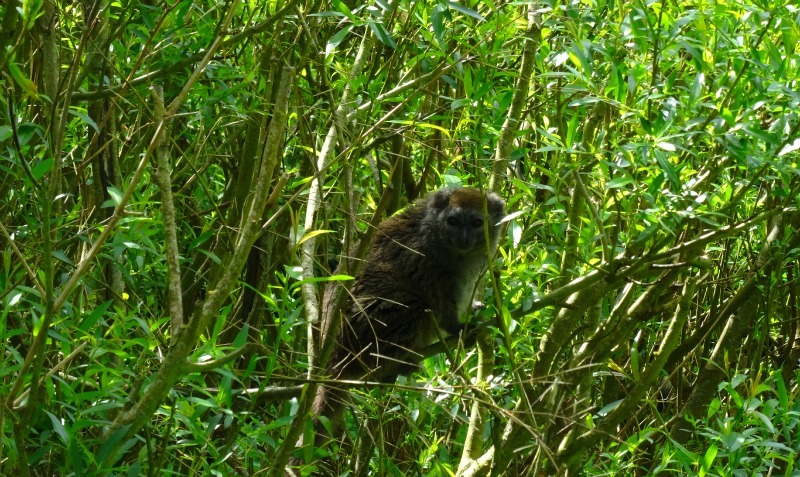 Scattered throughout the Park are various other lemurs like the red-fronted brown lemurs in Kirindy Forest and the Alaotran gentle lemur. Also known as the bamboo lemur, the Alaotran gentle lemur is the only primate whose habitat is wholly restricted to wetlands. These adorable, and as Gerald Durrell called them ‘honey-coloured teddy bears’, lemurs are critically endangered due to habitat loss. The lemurs at the Park have a great exhibit that replicates their natural habitat of papyrus reed wetlands in Madagascar with an outdoor enclosure full of bamboo. The most elusive of the lemur family is the aye aye, nocturnal by nature they are also endangered, like all lemurs, not only due to habitat loss but also from persecution from locals who believe to be bad luck and evil spirits. Aye ayes were one of those species I had never heard of until discovering them in the pages of one of Durrell’s books and I instantly fell in love – which is no surprise as I seem to be drawn to underdogs or ‘ugly’ animals. They probably won’t win any beauty contests for their dark, scruffy and thin hair, beady eyes, large ears, thick bushy tail and strange long middle finger. Their odd finger has a purpose, aye ayes tap their fingers along branches to locate insect larvae tunnels within and after using their large strong teeth to gnaw a whole in the branch they use their long finger to stick in the hole and pull out the larvae to eat. Durrell was the first organization to breed aye ayes in captivity and have successfully had 9 births. I’ve been to a few zoos that have aye ayes but due to their darkened habitats I’d yet to actually see one in person. That all changed at Durrell. I entered the dark inside of the Les Augrès Manor where the aye aye enclosure is, there was no one around, it was dark and quiet and I stood tense before the glass of the enclosure, my eyes darting in search of a glimpse. I bent down to look closer and heard a noise and after a blink there stood the elusive aye aye right in front of me. We held eye contact for what seemed like a minute but was probably closer to seconds and then just as quickly as it came into view it was gone. I stood up and shuddered with excitement – I finally saw an aye aye in person and boy was it a magical moment! If you’re hoping to see one check feeding times as this is the best opportunity to see them. 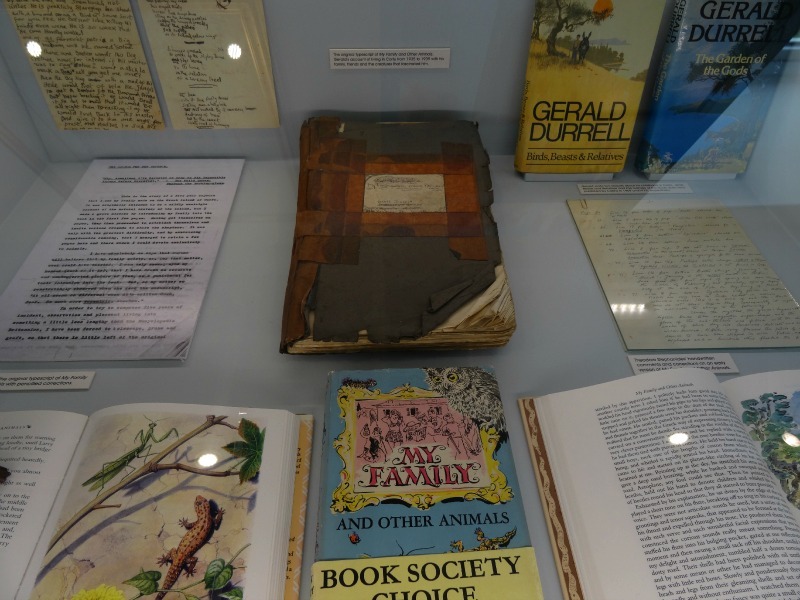 After my aye aye high I went to visit an exhibition put together by Lee Durrell, Gerald Durrell’s wife, the Gerald Durrell Story. I entered the small room that held objects from his travels, journals of his opened to show his writing, photos of him from growing up to searching for animals in the wilds across the globe and other pieces that showed just what an amazing man he was and his truly amazing life. First his stories and then his ‘zoo’ has helped inspire so many people across the globe to do their part to save endangered species and their habitats. As I walked around I was awash with pride in his dedication, passion and undying love and hope that continues on in those he’s touched – me, the awesome staff at the Durrell Wildlife Park and countless others working in the field. I want to first say thank you to the Durrell Wildlife Park and Hostel for hosting me. I’d also like to send a big thank you to Rick for all the help and to the passionate and welcoming staff and to the late Gerald Durrell for all he accomplished and for being such an inspiration. A visit to the Durrell Wildlife Park is a must – it just might change your life as it did for me, I will never look at zoos and animals in captivity the same way again.